Skiing is a great winter sport for everyone…whether you want to glide through the trees enjoying the scenery, or hit the snow park and practice your tricks! This is the thin layer of clothing you wear right next to your skin. It’s important that this layer is ‘wicking’ so that you stay warm and comfortable. You will sweat when you ski and if this moisture cools, especially when you stop to catch a lift or have a break, you will get cold. Wicking clothing is designed to quickly transport moisture away from your skin and then allows it to evaporate (through your breathable jacket)…keeping you dry and more importantly; warm. The best way to keep warm is by wearing layers under your ski jacket – trapping thin layers of air between clothing is a great way of insulating; keeping you warm without being too bulky. So, three thinner layers e.g. thermal base layer, one long sleeved polo neck and a thin fleece are much better than one thick fleece. Microfleeces and soft shells are ideal mid layers as they are lightweight and also wick away perspiration. Top Tip: Do not wear cotton or cotton mix fabrics as base or mid layers as these will retain moisture from sweat, making you damp and eventually cold. This is the outer most layer of your upper body ski wear and must be wind and snow proof to protect you from the mountain conditions. It’s also important that your jacket is breathable. When you ski, you will sweat and if this moisture is not allowed to escape, especially up the mountain, it will chill and make you cold. Pick a jacket that is not too bulky to make sure you can move freely, with space underneath for several layers. Top Tip: Having lots of pockets is useful, especially if you don’t want to carry a rucksack. These provide the outer level of protection for your lower body and, like your jacket, must be wind and snow proof…jeans or tracksuit bottoms are no good up the mountain! Many ski pants have high waists to make sure there is a suitable overlap between your jacket and trousers, keeping out chilly draughts and snow. Salopettes also have braces to make sure they stay up no matter how energetic you get. Ski pants and salopettes often have reinforced padding on the knees and seat, just in case you find yourself falling over. Snowboarders in particular will spend a lot of time sitting down or on their knees and this padding proves very welcome! Top Tip: When buying, make sure your trousers aren’t too long, or they will get trapped in your boot bindings. You lose up to 30% of your body heat through your head! A hat that covers the ears is an essential piece of gear for skiing and the fashion options are limitless. Helmets have become very popular for both adults and children and are strongly recommended…especially as you may end up skiing at high speed! Helmets are now also legally required to be worn by children in the USA and most European ski schools. Make sure yours fits properly, is comfortable and offers suitable protection for skiing. Also, you could think about wearing a thin balaclava or helmet liner underneath for warmth and comfort. Top Tip: Make a fashion statement of your helmet (and make kids more recognisable) with a funky helmet cover! This will give you immediate warmth…stopping snow and wind getting down into your jacket. A Choob is a small, really lightweight and adaptable thermal fleece which can be used as a neckwarmer, hat, headband or even a facemask! Top Tip: Even if you start off warm…stuff a Choob into your rucksack or pocket. They pack really small and you may well be glad of it if you get chilly later or the conditions change. Yes, it will be winter but regardless of the conditions, eye protection must be worn at all times when skiing and snowboarding. The sun is much stronger at altitude and the reflected UVA and UVB rays from the snow can also cause serious damage to your eyes. If you have a week of sunshine and you are not venturing into powder, then you can get away with just a good pair of sunglasses (UV400 rated). If that is the case, then make sure they cover your eyes completely (wrap around). If they do not, you won’t get full UV protection and when you start to blast down a fast run, you will be squinting (tears streaming) to keep the wind out. If it is snowing while you are doing it, you will be squinting so much that you will not be able to see! A retaining cord is also a good idea to hold them firmly in place and prevent them from getting lost when you fall over! Goggles are essential if it is snowing and are better at protecting your eyes from the wind. Single lens goggles, though cheaper, are prone to misting up and hamper vision in bad weather…double lens goggles are better. 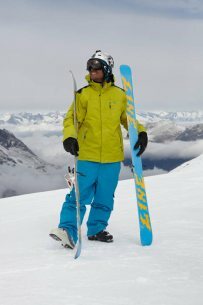 The lens technology on goggles has been developed specifically with mountain weather conditions in mind and ski goggles also cover more of your face, giving greater protection from the sun whilst anti-fogging technology continues to provide clear vision long after sunglasses have steamed up. Top Tip: If you are wearing sunglasses, always have a pair of goggles in your rucksack/pocket just in case. Ski goggles really come into their own off-piste or when conditions worsen and light levels are low. Hand protection is essential and should be insulated and waterproof. There are a wide variety of both gloves and mittens offering differing levels of waterproofness, insulation and breathability. Mittens are great for kids and those who suffer from cold hands. Gloves are often preferred by older children and most adults as they give more dexterity. Ideally there should be about ¼ inch at the end of the glove/mitten to allow air to circulate and warm around the fingers – you should also be able to clench a fist in order to grip a ski pole.Snowboarders should look for stronger and more waterproof palms. Top Tip: Make sure that your gloves are 100% dry for the start of the day. In low temperatures damp gloves can chill your fingers very quickly. It’s defintely worth taking a second pair. Clumping around in ski boots after a day's skiing is not fun, often uncomfortable and not recommended for the disco! Wellies are not suitable either as they are simply not insulated enough – a good pair of après ski boots will be warm and water resistant, with non slip treads for icy surfaces, and have warm fleece liners…perfect for après ski bum boarding, shopping, spending time in the bar or anything else you get up to after a hard day on the slopes! Essential due to the strong sun and reflective properties of snow. Windburn is also a problem and wearing lip salve even on a cloudy day will help prevent painfully chapped lips. Sunburn from high altitude sun can be much worse than summer sunburn, so you must take a high altitude ski cream and not just leftovers from summer. Our sun cream has a convenient lip-salve with SPF already attached and comes with a neck cord so that you carry it at all times. A small bag is very useful for carrying sun creams, extra mid layers, goggles, tools, cameras, a piste map, snacks and other bits and pieces. Some hydration packs also have room for a few items and are a great option. Do not take a large rucksack as this could unbalance you and may be awkward on the ski lifts. Hydration is also extremely important. On the mountain, you will not only be losing water through perspiration but the cold temperatures and altitude can dramatically increase the rate of water loss through respiration…up to one litre every four hours. The combined effect of the two can cause rapid dehydration on the mountain. The best way to keep hydrated is to use a hydration pouch such as a platypus. This will encourage you to drink little but often (the best way to keep hydrated). These hydration pouches can be bought either as the pouch and tube only or as part of a rucksack. Top Tip: Insulate the tube of your hydration pouch…otherwise it is very likely to freeze. These are small and inexpensive but are great for keeping skis together making them much easier to carry; you can also identify your own skis quickly and easily. Although most lifts in Europe are controlled by electronic gates, meaning you can keep your lift pass in your pocket, a small plastic holder to attach your lift pass to your jacket will ensure the lift pass (probably the most valuable item you will carry) is safe and easily accessible. If you wear your ski jacket and snow pants a lot, at some point you will need to clean and re-proof them to make sure they stay waterproof. It is important not to use a regular detergent cleaner as this will ruin your garment…stopping it from being waterproof and breathable. Nikwax Tech Wash or Grangers 30°c Cleaner will remove dirt without damaging your clothing. Nikwax TX Direct or Grangers 30°C Proofer adds water repellency to cleaned garments, and revives breathability for waterproof breathable fabrics. Grangers 30°C 2in1 Cleaner / Proofer will clean and re-proof in one wash only.